Finding the perfect bicycle touring shoe is a challenge… but not impossible! There are plenty of cycling-specific shoes that are good looking, designed for maximum performance on the bike, and comfortable to walk in once you step off your two-wheeled vehicle at the end of the day. Below you will find 17 stylish pairs of SPD cycling shoes that are perfect for commuting, mountain biking and/or bicycle touring because they look good both on and off the bike and they can be walked in with relative comfort (thus reducing the need for many traveling cyclists to carry two separate pairs of shoes). Below each of the shoes on this page will find a yellow “Buy Now!” button, which you can click if you are interested in purchasing a pair of these shoes for your own commuting/touring/mountain bike adventures. Cruise into comfort and style, on and off the bike, with Mavic’s Cruize SPD cycling shoes. Mavic’s Trail Grip outsoles are stiff for efficient pedaling and they have rubber lugs for shock absorption and traction. You’ll also love the softshell uppers and the ergonomic insoles that fit and feel great. There are also reinforced toes and heels for protection and durability. These Shimano MT33L bike shoes feature stiff midsoles and great tread patterns, making them ideal for mountain biking yet completely at home while commuting, touring and riding casually. For casual riding, you need a comfortable shoe, like the Shimano SH-MT44 shoe. With a breathable mesh upper, and an easy-to-use drawcord closure, it’s perfect for recreational riding, with or without clipless pedals. And with the extra roomy toe box, you won’t feel like you’re cramming your feet into tap dancing shoes, which is perfect if you find yourself having to walk your bike.To ensure a tunable fit, the upper is built out of a blend of stretch-resistant mesh and synthetic leather. The mesh panels improve airflow to keep your feet cool. Synthetic leather and mesh. Madmade sole. X-Road nylon plate delivers great pedaling stability, power and efficiency with off-the-bike comfort and walk-ability. Blown rubber lugged outsole for superior traction and durability. SKYDEX heel crash pad for excellent off the bike shock absorption. Flexible forefoot and a running shoe beveled heel. Mavic Alpine shoes feature a balance of rugged support, breathability, abrasion resistance and the Trail Grip Outsole for trail traction, efficient pedaling and all day comfort. Plus, the best part is, these cycling-specific shoes don’t look like traditional shoes made for bicycle riding. This carbon soled shoe adapts to every shape of foot with thanks to its special upper construction. This shoe will also keep you feet fresh thanks to its clever ventilation system, giving an all round superb cycling experience. The X-Alp Seek V is an update to Pearl Izumi’s best selling, most versatile cycling shoe ever. It looks as good walking through town as it does riding your favorite trails. A crossover, dual-purpose shoe, the lightweight Pearl Izumi Fuel bike shoes boast a running-shoe-style upper and a rubber lugged bottom for efficiency and comfort when cycling or walking. Comes in both men’s and women’s styles. 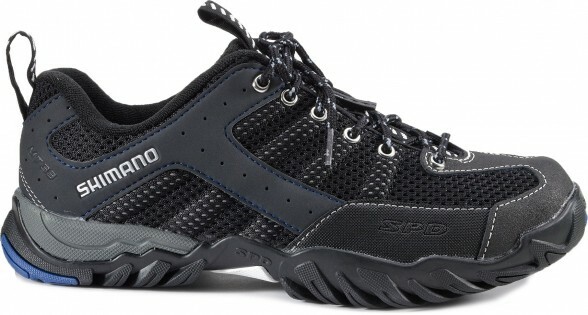 A stylish and comfortable cycling shoe designed for mountain biking, for also used for commuting and touring purposes. Season: Year-round items. Type/Intended use: Mountain/Commuting/Touring. Pedal systems-Compatibility: SPD. Giro’s Terraduro Shoes address all the shortcomings of traditional mountain bike shoes by making your pedaling as comfortable as traversing obstacles by foot. The Terraduro features a robust nylon shank that pedals as an XC shoe should, but it’s combined with a Vibram rubber outsole with flex engineered in the forefoot to inspire confidence when side-stepping rocks and logs. The fit is secure and supportive thanks to Giro’s micro-adjustable buckle and two hook-and-loop straps. To keep things cool, perforations and a breathable microfiber interior let air flow, which is treated with Aegis for microbial management. On the durability side of things, a reinforced toe box protects from impacts and brushes off abrasions. The Pearl Izumi X-Alp Seek IV bike shoes boast a running shoe style upper and a carbon rubber lugged bottom for cycling and off the bike adventures. Do you have experience with any of the SPD bike shoes listed on this page? If so, what do you think of them? Also, are there any other stylish SPD shoes that I missed that should be included here? Leave a comment below and let me know what you have to say! This entry was posted in Bicycle Touring Pro Articles, Clothing, Featured Articles, Featured How-To Articles, Main Articles, Products, Shoes and tagged best bike touring shoe, bicycle shoes to walk in, bicycle touring shoes, bicycle walking shoes, casual cycling shoes, commuting bicycle shoes, cycle touring shoes, cycling touring shoes, spd bicycle touring shoes, spd cycle shoe for touring, spd cycling shoes, stylish biking shoes, stylish cycle shoe, touring shoes. The Keen Commuter is my shoe of choice for touring. Because it is a sandal, it is well ventilated and cool in warmer weather and if it gets wet, it doesn’t matter because it will dry quickly as you ride. The solid toe offers good protection. They are good off the bike as well. No noisy clicking announcing your arrival. The drawback is when on a dirt or gravel pathway as particles can get in easily. But, shoe covers can solve that if needed. I’ve done a lot of touring in Central America and Southeast Asia and agree 100%. Anyplace that’s hot and wet, the Keen sandals are the only way to go. I think Shimano makes some too but I’ve never tried them since they don’t make anything larger than a size 14. For riding I use very lightweight socks to prevent blisters. A shoe rubbing against a sock is much better than rubbing against bare skin for 8 hours. Black is preferred since the roads in these places are pretty dusty and dirty. When walking, sockless is fine in these. I have a pair of the Shimano MT60. I like them. They are comfortable on and off the bike. I wore them for the first time on a week tour in Idaho. I haven’t attached the SPD cleats as yet, I use toe clips right now. I plan on using SPD pedals for my tour next summer. I will install them so I can get used to them. I haven’t ridden with SPD’s before. I have look pedals and cleats on my rode bike. I use Shimano sandals (with socks) and could use them in bad weather with booties or neoprene socks inside the sandals. They are comfortable enough to use off the bike, too. Advantage to sandals is that I never get a hot foot in really hot weather. I also have a pair of Sidi Mega, an extra wide version to accommodate bunions. I’ve had a pair of SPECIALIZED CASUAL – BG TAHOE SHOE for 4 years now and they offer all the support and comfort whilst riding. Off the bike they are comorttable to walk around in and they look good too. I do get a little clicking from the cleats when walking sometimes but to me its worth it for the plus points. Hullo Darren. Let me give you an Australian slant on shoes. Firstly, cleated shoes are likely to land you in hospital when riding a heavily laden touring bicycle on unsealed gravel or sandy roads, of which we have many. Reason?…loose gravel/sand can bring you down so quickly that you cannot disengage quickly enough to avoid a heavy fall. Secondly, we have a big problem with grass seeds. If you are bush camping in cycling shoes (especially those with velcro straps – a real no-no) then you will spend lots repeat lots of time every day picking spear-like seeds out of your shoes. This I learned the hard way. Philip Bissell has made a very valid point about the downside of cleated footwear for off road cycle touring. The old style / method of using toe clips and straps is much more user friendly for problem terrain, where you are likely to pick up various small items on the soles of shoes that will block up cleats. Unfortunately most off road cycling shoes have rough serrated soles that hinder placing or removing shoes from pedals with toe clips fitted. It’s about time manufacturers addressed this problem and start making shoes that have a smoother tread that doesn’t snag on toe-clip fitted pedals. Wow awesome post. I’ve been researching road cycling shoes for a while and I really think this site has helped me decide thanks for the post. I was searching for shoes on this site, https://www.road-cycling-shoes.co.uk/. They have some really nice ones there. Anyway I think I’m finally ready to make the purchase. Hullo again Darren. I have just been reading the comments above regarding shoes suitable for bicycle touring and am moved to write again – this time on Shimano sandals. I tried them. In fact I have had three pairs and they all fell apart. Yes, I mean fell apart. . .and this after only a year or two of use. One pair came to an untimely end halfway through a long-distance tour and if any reader has ever tried to replace a pair of cycling shoes in the Australian bush, well. . . So much for Shimano sandals. Great for breezing about town, but for touring under rugged conditions – definitely not. These are interesting and nice, but I have a wide (EE) foot and none of these appear to be available in anything but D. I use Sidi’s for for my MTB, but would like a different shoe for my roadie. I don’t do any multi-day rides (yet), but it is nice to be able to run to the market or pub on my road bike and have shoes comfortable to walk in. (I ride clipless and would prefer to stay that way). Any suggestions for a EE touring shoe? Shimano sandals are really great for touring. I’m surprised they are not on your list. Very comfortable to ride in. Easy to adapt to cold or wet weather (Sealskin booties or as many pairs of socks as you’d like) Very adjustable for those with a wide OR narrow foot. Comfortable and stylish off the bike too. I’ve been a MANY multiple day tours where my sandals were the ONLY pair of shoes I brought. AND….believe it or not, they are great hiking shoes….stiff soles and no toe jam on the down hills. I tour in a pair of Keen Arroyo SPD sandals. They are really a cross between a shoe and sandal as they have a full heel. Having the full heel, instead of a heel strap, gives more stability and stiffness. Also, the Arroyos are leather and have held up much better than the Keen Commuter Sandals, which I have also used. Have you, or anyone else commenting here, used a cycling specific winter boot? I’ve seen a few, but not many reviews. A wide footed friend & I decided we can’t wear any shimano shoes (narrow & hurt little toes). He likes the fit of his SiDi Mega (their wide size, quality but pricy). Chainwheel folks say “Bongrager are a little wider than shimano, next wider are NorthWave – fantastic for wide feet”. J&P store here had a set of ExuStar that worked for me on a first longish ride. That is 5 to try on a wide foot: SiDi Mega, NorthWave, ExuStar, Bontrager – or Phillip’s boot idea above. I am using the Shimano RT82 Touring Shoes for commuting. I had a pair with a more flexable sole, which wasn’t as good on the bike, and these are not as good off the bike, but given my current main use case (mainly cycling and popping in to the supermarket) they are fine – I don’t think i would want them as my main shoes. I would class them as excellent bike shoes which you can walk in. I have the Pearl iZUMi X Alp. Very good shoe and perfect on cooler days. When it gets hot outside it’s Keen SPD sandals. Can’t remember which model, maybe the Arroyo, but I wouldn’t bike during summer without these. We, in The Netherlands, are almost born on bikes. My mother still did her shopping on a bike when she was 85. In our country you don’t see any helmets, SPD-shoes, nor special outfit. Riding a bike is our national transportation system. A way of life that needs nothing more than a simple bike. The whole traffic is built around bikes and takes care of decent road conditions. Having said that, you can imagine, my partner and I, also long-distance bikers all over the world, never use SPD’s. For us it’s a nuisance to be clicked to your bike and even dangerous in sudden accidents. The “SPD-advantage”, some slight 5% more effective use of energy, is something to count with if you want to win matches, like the Tour de France. Not for riding 3 months to see the world from the perspective of a biker. For us SPD serves no purpose at all. Expensive, hard to walk on, extra bagage, a fancy no-no. I found most of the shoes pictured had laces rather than velcro straps. There were a few where velcro covered the laces. I think some velco strap is always needed; for the laces can loosen and get caught in pedals or wheels. Also, if for some reason, the shoes must be taken off, it can be done quickly with velcro straps. In catalogs, I’ll go through the entire ‘shoe’ section and just see velcro straps, as though it’s a staple. I’ve seen others who’ve stopped rides and tied different types of knots to prevent loosening. I use Bike nashbar Sandals. I have used them successfully for five years and only worn out one pair. I am currently doing about 16,000 miles a year of riding in a wide range of weather conditions, but not in snow. If it is cold polar tech socks and occasionally toe covers seem to do the trick. These shoes protect my foot and have eliminated hot spots which I experienced for years before sandals. I use them with spd, but always adjust the pedals to the least possible tension, easy in easy out. I have also used them without pedals on rented bikes in Europe. I do think taking your pedals on tours is much better. Along with my own pedals, i take my saddle and ergo grips whenever I rent a bike for a tour. if i were going to be off road I would get a pair of Shimnao A530 pedals which are spd on one side and regular on the other. I ride everyday and enjoy it a lot. Sandals make it so much better. While the masses can usually wear off the shelf footwear of any sort, there is a small number of custom cycling shoe manufacturers that are out there and necessary that have to deal with odd shaped feet, different leg lengths requiring custom soles, and a number of other abnormalities. I have to shake my head and wonder why some cyclists would buy a new pair of shoes every year, and even own multiple pairs of shoes, when a custom pair if shoes can last 5 years and more, and are in most cases repairable when a part fails. Also, bulk manufacturers do not have the capability to deal with any abnormalities. If you’re going to spend 8 hours a day in a pair of shoes they gotta be comfortable and functional. How do you put a price tag on that! The only SPDs that I have found comfortable to wear are Keen Commuter III SPD sandals. I have extra wide feet and and enlarged big toe joint. These are great for cycling whether racing or touring. I use size 8, the nearest I can get in SPD shoes that almost fitted my feet were size 11! Darren, I like the lineup of shoes…but….I’m 6’3″ with size 13 feet (roughly 49). None of the shoes reviewed even come in that size. I love touring & have an older set of shimanos (I don’t even know the model), a set of Lake winter boots & a set of Keen cycling sandals. I was looking to replace my aging shimanos but I’ll just keep looking. There needs to be more input for us Clydesdales. Anyway, the review was interesting…did your ride each shoe to see how they perform? Darren, I ride with toeclips. I have absolutely no interest in clipless pedals or cleated shoes, bit I’d like to have a touring- or mountain bike shoe with the stiff sole that would make long days on the pedals more comfortable. Any suggestions? Hmm, it’s a good question, but I don’t really have a good answer for you… because you’d probably be looking for a non cycling-specific shoe. There are some cycling shoes made for cycling that have rigid soles (like this one, for example: https://www.sierratradingpost.com/teva-links-shoes-for-men~p~7859g/), but I’ve never used them. I usually either cycle in SPD shoes… or in a regular old pair of tennis shoes (the firmer the sole, the better). I’ve been riding cleated shoes since the early 80’s when the first “Campagnolo” and “Look” pedals came on the market. Releasing has never been a problem if they are adjusted properly. They don’t need to be tightened down to the limits, this is not velodrome racing. With the clip force set for touring, they release instantly and without any conscious effort while still giving a benefit in climbing. There have been a few occasions of inadvertent release but that’s a lot better than the effectively continuous release of a platform pedal. But, in the end, ‘to each, his own’. A final word, with the Keen closed-toe SPD sandals and a reversible pedal you can instantly chose cleat or open platform to suit the conditions and terrain.